Representative Honours: Northern Ireland: 25 Full Caps (1954-1963), 1 Amateur Cap (1952), Youth Caps, 4 Schoolboy Caps (1947); Irish League: 1 Cap (1952). Club Honours: (with Man. United) FA Cup Runner-Up 1957/58. Awards: Goalkeeper of the Tournament (World Cup - Sweden 1958); MBE (1995). 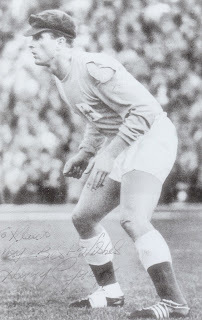 After retiring as a player due to a shoulder injury sustained while player-coach at Stoke CIty, Gregg had spells managing Shrewsbury Town (1968-72), Swansea City (1972-75), Crewe Alexandra (1975-1978) and Carlisle United (1986-87) as well as spells coaching in Kuwait (1978), at Manchester United (1978-81) and Coleraine. 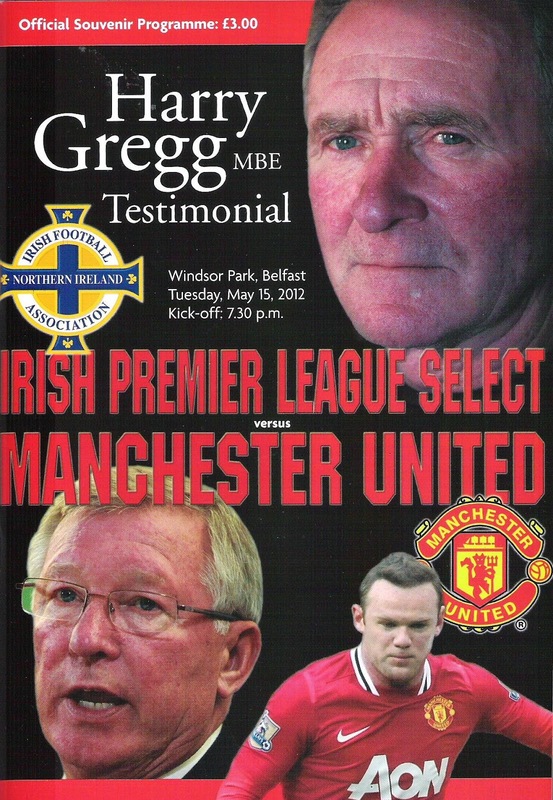 In 15th May 2012 Manchester United visited Windsor Park for Harry Gregg's testimonial match, defeating an Irish League XI 4-1 (full details below). Summary: 25/0. Won 7, Drew 7, Lost 11. Sources contradict, some list birth date as 25th October, however his autobiography, Harry's Game, lists it as 27th. Alan Blayney (Linfield) [sub: Sean O'Neill (Crusaders) 46]; Jim Ervin (Linfield) [sub: Sean Hargan (ex-Derry City) 72], Ross Redman (Portadown), Howard Beverland (Coleraine) [sub: Peter Hutton (ex-Derry City) 72], Albert Watson (Linfield), Philip Lowry (Linfield), Chris Morrow (Crusaders) [sub: Stephen Lowry (Coleraine) 59], Jamie Mulgrew (Linfield) [sub: George McMullan (Cliftonville) 66], Chris Scannell (Cliftonville) [sub: Mark McAllister (Linfield) 66], Gary McCutcheon (Ballymena United) [sub: Martin Donnelly (Cliftonville) 56], Barry Johnston (Cliftonville). Anders Lindegaard [sub: Ben Amos 62]; Patrice Evra [sub: Luke Giverin 46], Phil Jones, Rio Ferdinand [sub: Ashley Young 46], Jonny Evans capt, Michael Owen [sub: Wayne Rooney 62], Dimitar Berbatov [sub: Paul Scholes 72], Ji-Sung Park, Nani [sub: Ryan Giggs 72], Tom Cleverley, Antonio Valencia [sub: Michele Fornasier 72]. The proceeds of this match were donated to charity. I first became aware of Gregg as a boy of eight hearing about the Munich aircrash. I remember seeing him flattened by Nat Lofthouse in the Cup in 1958. I followed his career from then on. He was a great 'keeper on his day though a bad shoulder injury robbed his of his best years and the chance of honors with Manchester United. As a goalkeeping coach, I do not think he had a peer. A great man as well as being a great keeper. A true hero.